The last time I went to my spiritual director, we talked a lot about the people who have harmed me in my past. This wasn’t really what I wanted to talk about. I’d rather just jump right ahead into forgiving them. She wants me to pick open that wound and study it for a bit. She wants me to dig down to what I’m feeling. Then dig down below that. Anger, sure. But beneath anger is sadness, and grief. It is a sense of loss, of not-having, of never-will. It is a sense of something that I think should be mine, isn’t. This is a foreign feeling, and even more foreign that an expert is telling me to stay with this feeling. Surely I should “turn the other cheek,” right? Surely I should “forgive and forget,” right? But she says to stick with it. Every month I come back and I’m ready to forgive and she thinks I’m not ready yet. So, par the course for me I made a bracelet to help me remember. 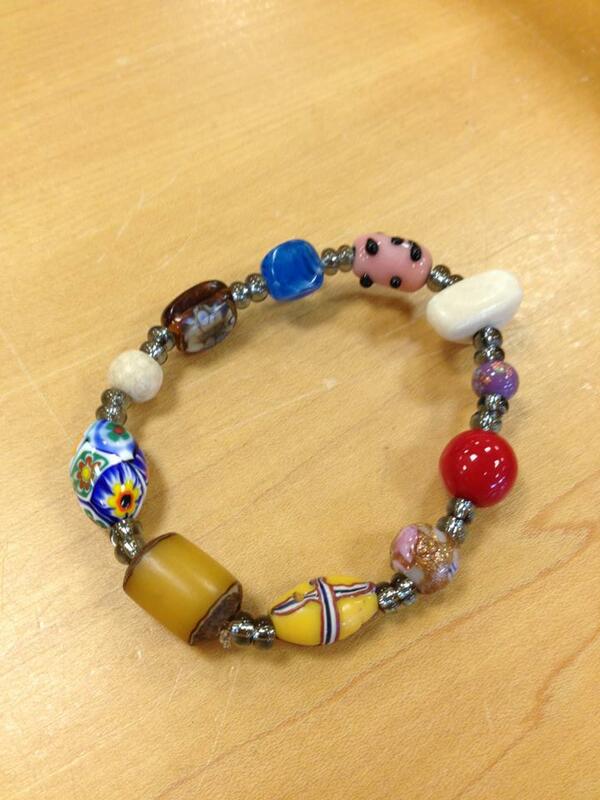 I put a bead to remind me of each person who has harmed me. I did this fairly fast, so there are some I’m forgetting, I’m sure, but fast work means that I don’t overanalyze it. I’ve also been writing about how I was harmed by my parents, and also my brother. Writing about it is hard. I don’t want to dig up these old bones. She had me look at that feeling – why do I not want to talk about it? In part it is because I feel like I am betraying them. I feel like I’m being disloyal to them. We aren’t supposed to speak ill of the dead. Nothing is stronger than blood, right? I say that they meant well, that they didn’t know any better, that they themselves were raised badly. She says those are covers. That there is something I’m not looking at. That I need to focus on how I was harmed. I need to focus on that I was harmed. There is certainly a bit of shame that comes in the mix when using the word “victim.” Am I to blame for what happened to me? Is it my fault? Could I have stood up for myself? Was I too passive? By not speaking up for myself, I allowed it to happen. They couldn’t have known they were harming me unless I said something. To not speak up is to give acceptance. I hate going to the spiritual director’s. Every month, about a week before, I start to dread it. I don’t want to talk about what she wants to talk about because it is going to be hard. I want to make a list and tell her what we are going to talk about and use up all the time so that I don’t have anything hard to talk about. But then that wastes the whole point of going. It is like going to a personal trainer at the gym and saying all I want to do is jumping jacks for an hour. I’m not going to work on anything meaningful that way. I’ll have wasted my time and my money. She’s like a personal trainer for my soul. We dig down to uncover broken pieces and blockages. I read once that the goal in life isn’t to learn how to love. It is to remove all the barriers we have put up against love. I think the person quoted Rumi. I’m sure he said it better. But look, here I go, walking away from the topic again. I’m a wiggly one, always trying to get away from what bothers me. I guess that is normal human nature. We often try to anesthetize ourselves or run away. It is important to acknowledge loss. It is important to admit that it happened. To heal it, you have to know it is there. And that means a lot of digging. So while I’m constructing the victim bracelet, I’m realizing that these are all people who have sinned against me. And then I think – what about all the people I have sinned against? Am I justifying? Am I putting the blame back on me? Am I letting them off the hook? Am I avoiding the problem? Sounds like it. So I’m staying with this. I’m not through it. I certainly want to be. I want this to be over and done and healed and let’s go on to the next thing and make it a happy one, please. And I’m running away again. I’ve heard that grief takes a long time. I’ve heard that you grieve for half the amount of time that you’ve known the person. This is grief. This is going to take a long time. It has grown down deep. And just like digging out privet in the back yard, this is going to take a lot of work and some special tools to get all of it out. Leave just a little bit of privet root and it will come back next year. Cut it down at the top and it will get even stronger and root down further. The only way to get it out is to dig it up, all of it. And the only way to do that is to work on it patiently and thoroughly. This entry was posted in Beads, Religious and spiritual and tagged blame, dysfunctional families, grief, healing, it is up to the student to do the work, self love, self-care, shame, spiritual director, victim. Bookmark the permalink.